I am a first generation American from a South African Indian family. Initially, telling my parents that I started antidepressants was a struggle. They didn’t understand why I would need them and thought it was unneeded. I think culturally they don’t see mental health the same as physical health. They told me I should try yoga, meditation and change my diet to be happier in life. While some of those things might help, by that point I had already tried those things and they didn’t help enough. Medication was the only thing that really pulled me out of the pits. It has taken some years, but they are finally seeing that medication has helped me and I hope that changes how my family sees it. Culturally, they believe in solving problems using “natural” solutions. They also did not understand why I could be depressed because I had everything I could want. They can understand why family members back in South Africa experience depression; their experience is justified because their family back home is faces financial and health struggles. My parents could not understand what they did wrong. I think they felt attacked when I told them that I was taking medication for depression, so they, in turn, attacked me as a way to defend themselves. Mental illness does not discriminate. 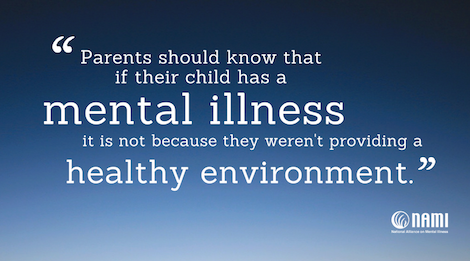 Parents should know that if their child has a mental illness, it is not because they weren’t providing or creating a healthy environment for their child. I think it is important for everyone to understand that you can live with mental illness no matter what your life is like. Reeka is a NAMI Ending the Silence presenter with NAMI Dallas, which serves four large urban and suburban counties that are home to hundreds of thousands of families from a wide variety of cultural and ethnic backgrounds. Reeka is proud to share her story and serve as someone that students can relate to. Her story is the first installment of a three-part series during National Minority Mental Health Awareness Month.